Specializes in: Pediatric, geriatric, patients with special challenges, vision and learning issues, vision therapy/rehabilitation, concussion/traumatic brain injury, and all vision rehabilitative care needs. Dr. 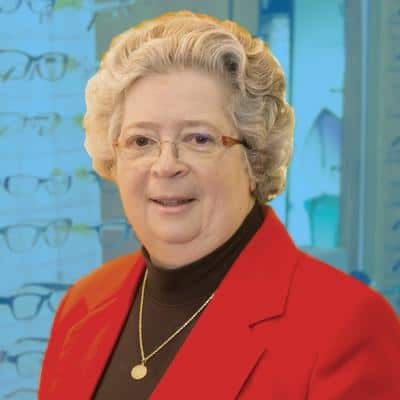 Moon has been a member of the American Optometric Association (AOA), the Pennsylvania Optometric Association (POA), and the Mid-Counties Optometric Association (MCOS) for her entire professional career. She has served as vice-president and president of the MCOS, President of the POA, President of the Altrusa International, Inc. of Centre County, the Professional Advisory Committee of the Central Pennsylvania Sightloss Support Group and the Centre County Learning Disabilities Association, chair of the Women in Optometry Task Force and the Professional Development Committees, the POA’s Board of Directors as Division Executive Officer for the Administration and Planning, the Communications, and the Professional Development Divisions. She recently completed 8 years of service on the Pennsylvania State Board of Optometry – 6 of those years as chair of the board. This position was a governor’s appointment and a Senate confirmation. In addition, she has been a member of the Low Vision Rehabilitation Committee, the Editorial Review Committee, the Motorists Vision Committee, the Nominating and Evaluation Committee, the Interprofessional Relations Committee, the Healthy Persons 2010 Committee, the Conference Planning Committee, and the Pediatric Vision Care Committee for the POA. She currently serves on the Centre County United Way Women’s Leadership Committee. She is a long time member of the Centre County Local Children’s Team Committee. Recently, Dr. Moon has been elected to the National Board of Examiners in Optometry – serving on the board’s finance and examination committees..
Dr. Moon was awarded the Dr. W. David Sullins Award by the American Optometric Association (AOA) which recognizes an individual doctor of optometry who has made significant contributions to optometry and public service involving the InfantSEE ™ program. Her most notable contribution to the Pennsylvania Optometric Association (POA) has been in the development of the POA’s Kids Welcome Here (sm) pediatric vision care campaign. In addition, her peers named her the “OD of the Year” for both the Mid-Counties Optometric Society and the POA. She was one of the founders of the annual Give Kids Vision for the Future program in cooperation with the Centre Volunteers in Medicine. In 1992, she was the recipient of the Penn-Del AER Distinguished Service Award. Dr. Moon is a fellow in the American Academy of Optometry. Dr. Moon is a founding partner of Nittany Eye Associates. In addition to her optometric training, she completed specialized residency training in Pediatrics and Binocular Vision Rehabilitation Services. She has served as a consultant for 11 years at the John Heinz Institute of Rehabilitation Medicine in Wilkes-Barre and has provided consultative services to the Tuscarora Intermediate Unit, the Keystone Central School District, the Mifflin County School District, and the Neurodevelopment Team at the University Hospital and Rehabilitation Center of the Hershey Medical Center. She has also provided consultative services for the Defense Department and Veterans Brain Injury Center in Johnstown and the Pennsylvania Bureau of Blindness and Visual Services. In addition, she has also co-authored a chapter in the newest edition of the premier textbook utilized to train professionals in the vision rehabilitation field – “Foundations of Low Vision” – AFB Press. Dr. Moon recently was a contributing author for the Oxford Press publication – “Oxford Research Encyclopedia of Communication – Vision and Promoting Health” (in print January 2018).